SAN FRANCISCO (AP) Pablo Sandoval left Boston last season and returned to the San Francisco Giants realizing he no longer held Bay Area star status. ”I accepted my job and I came here to have fun,” he said. He certainly is lately, with Sandoval delivering again – even if not quite the way he did as 2012 World Series MVP. Sandoval singled home the winning run with one out in the bottom of the 11th inning a day after driving in five runs, sending the Giants to a 2-1 victory over the Chicago Cubs on Monday night. Brandon Crawford was intentionally walked by Pedro Strop to load the bases and bring up Sandoval, who hit a sharp single to left against a five-man infield. ”You can’t let that affect your at-bat and I don’t think it did Pablo at all,” manager Bruce Bochy said of the infield drawn in. Andrew McCutchen and Brandon Belt started the rally with consecutive one-out singles off Steve Cishek (2-1), who entered with one out in the 10th and immediately gave up Hunter Pence’s triple before working out of trouble. Ty Blach (6-5) pitched a 1-2-3 11th for the win. The Giants came through an inning after missing a big chance with Pence on third. Pinch-hitter Chase d’Arnaud struck out with the Cubs playing with five infielders, making him 0 for 16 in his last nine games. Then Steven Duggar also struck out. Ben Zobrist hit a two-out double in the ninth off Will Smith but David Bote then grounded out. A day after the Giants scored 13 runs, they needed every last chance. Alen Hanson tied the game in the fifth when he blazed around the bases to score from first following a failed pickoff attempt and Anthony Rizzo’s second error of the inning. The ball skipped by the first baseman and rolled beyond the visitor’s bullpen in right-field foul territory. The speedy Hanson slid headfirst with his left hand touching home before catcher Willson Contreras could tag him. Pitcher Kyle Hendricks took the blame for a tough throw to Rizzo. The Cubs right-hander struck out eight and pitched into the ninth as manager Joe Maddon got a pair of relievers up in the bullpen. 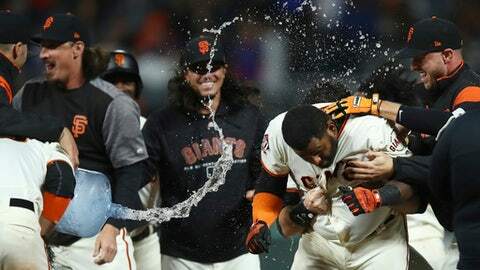 After Belt drew a one-out walk, Hendricks’ night was done and he gave way to Randy Rosario. Hendricks is winless in four starts since beating the Cardinals on June 16. Giants starter Andrew Suarez has allowed two or fewer runs in each of his last six outings. He gave up one run on three hits, struck out five and walked four in six innings. McCutchen stayed right at .300 (166 for 554) for his career against the Cubs. He is one of 13 players with a .300 or better batting average and at least .400 on-base percentage facing Chicago – and 10 of those are Hall of Famers. Joey Votto is the other active player. Cubs: 3B Kris Bryant (left shoulder inflammation) went 2 for 4 with a two-run homer and three RBIs as he began a rehab assignment with Double-A Tennessee on Monday. Bryant was set to play another game with Tennessee on Tuesday, Maddon said, then be re-evaluated. … RHP Yu Darvish played catch and is ”still trending in the right direction” as he works back from tendinitis in his right triceps, according to Maddon. Giants: C Buster Posey will miss the All-Star Game because of a lingering right hip issue that needs an injection to calm the inflammation. The Giants had been discussing the possibility for about a month, Bochy said, and Posey is scheduled to have the injection after Sunday’s game Bay Bridge Series game against Oakland. ”His situation with the hip, we’re hoping to get to the All-Star break and he will get an injection, but he’s going to need some time after that,” Bochy said. ”He won’t be able to participate in the game.” Posey sat out two games in late May at Wrigley Field with soreness in the hip. … OF Gorkys Hernandez was out as expected a day after leaving the game with a tight calf after hitting a two-run single in the sixth. Bochy said Hernandez is likely to play Tuesday. Cubs: LHP Jose Quintana (7-6, 4.22 ERA) tries for his first career victory against the Giants after going 0-3 with a 5.82 ERA in his first three starts. Giants: RHP Johnny Cueto (3-1, 1.95) makes his second start since coming off the disabled list from a 61-game absence with an inflamed pitching elbow and seventh overall in 2018. He is 9-9 in 25 career starts vs. the Cubs.